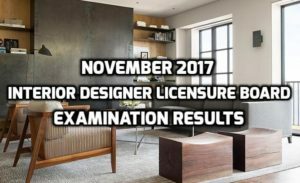 The board examination for the November 2017 Interior Designer had been determined by the Professional Regulation Commission (PRC) on Friday. As detailed through the official website of PRC, 473 took the examination held last November 7, 2017 and only 113 of them passed the licensure. The commission’s Board of Interior Design administered the board exam held in Manila and was able to release the name of passers after 8-working days of the scheduled examination. The chairperson of the board Sonia Santiago-Olivares headed the licensure and assisted by board member Maria Carlota D. Hilvano. For all those who passed, it is advisable that they visit the website of PRC online (prc.gov.ph) to check the necessary guidelines and requirements for their official registration.